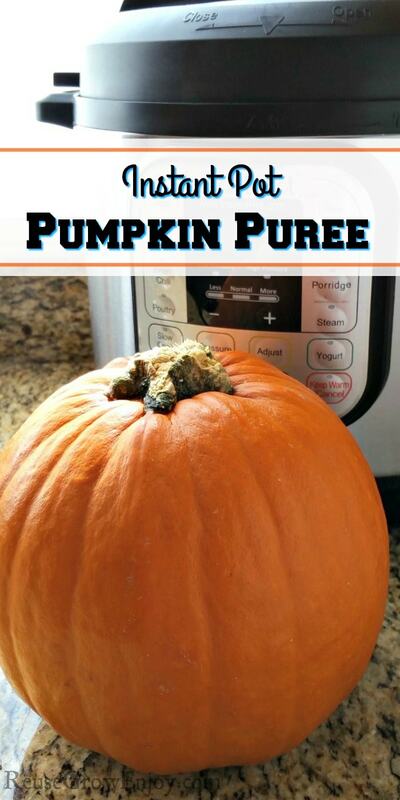 If you have a fresh pumpkin or two that need to be used, this is super easy. 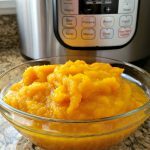 You can make homemade fresh pumpkin puree made in the Instant Pot! 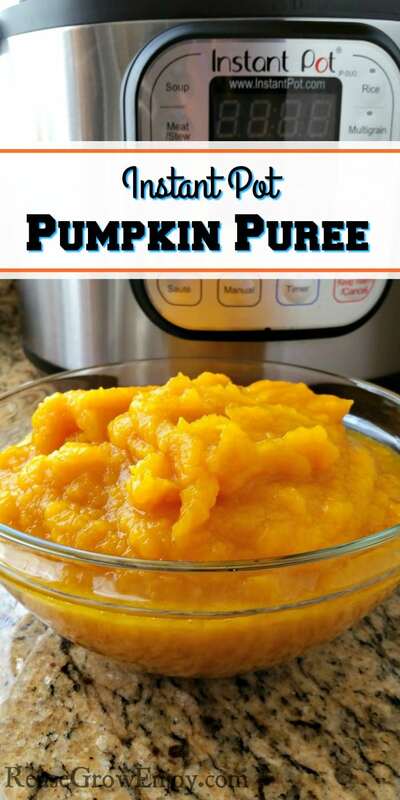 I am so happy I have found (and you will be too) this way to make pumpkin puree! It is hands down the easiest way I have ever done it. 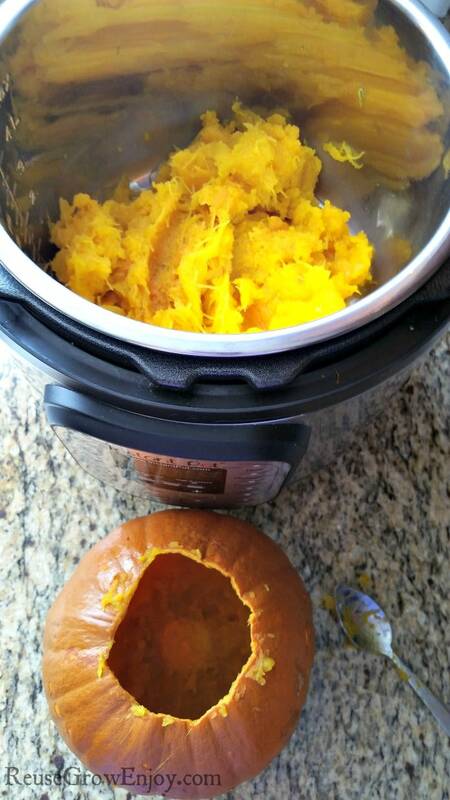 It makes turning a fresh pumpkin into pumpkin puree a snap! No more are the days of having to try and peel the pumpkin with a peeler. Or having to boil it on the stove forever to soften it up to scrape it off. Plus, I always felt that when I boiled it, I lost out on some of the vitamins being boiled out in the water. That is something I do not want to miss out on as pumpkin is so healthy for you. There truly are some amazing pumpkin health benefits! Other than a pressure cooker/Instant Pot to make this recipe, you will also need an immersion hand blender or a potato masher. This can be stored in an airtight container in the fridge for up to one week. You could also can it if you do canning. 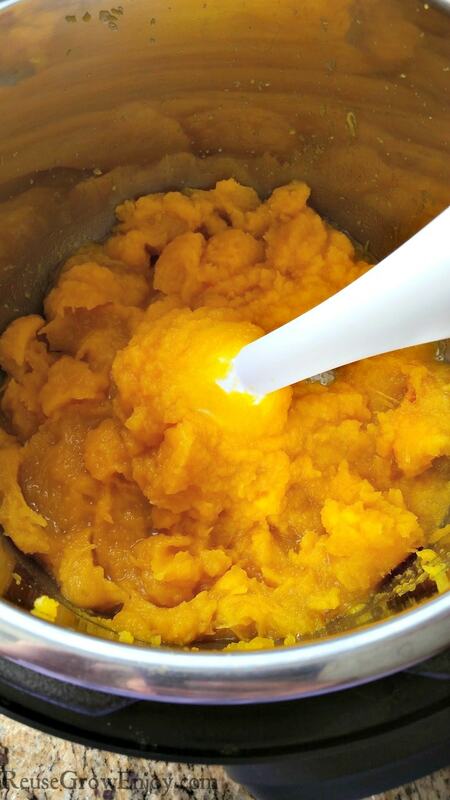 Knowing how to make fresh pumpkin puree is really handy when you are on diets like Paleo or Whole 30. Because you are making it at home, you don’t have to worry about any extra additives. How Much Pumpkin Puree Will A Small Pumpkin Make? The pumpkin I used weighed about 3 pounds. After I scraped it out of the pumpkin and blended it until it was that smooth puree texture, it made just under 4 cups of pumpkin puree. Can You Use A Larger Pumpkin? 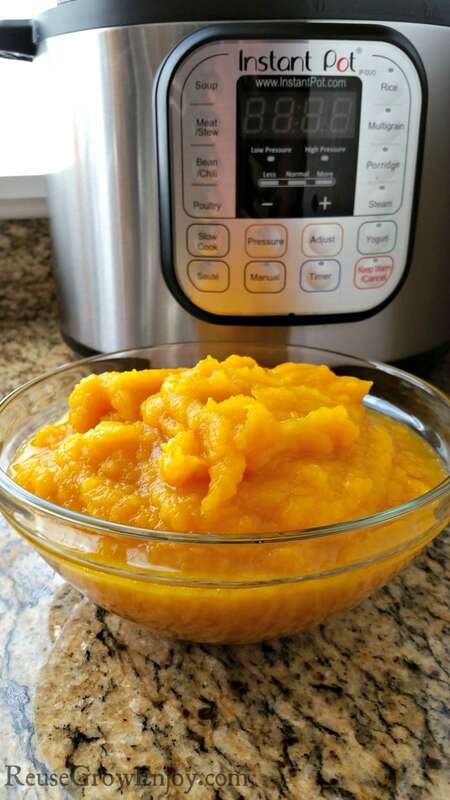 While I am going to show you how I made this pumpkin puree in the Instant Pot using a whole small pumpkin, you could also use a larger one. If you have one that will not fit whole in the Instant Pot, simply cut it into smaller chunks until you have a pot full. 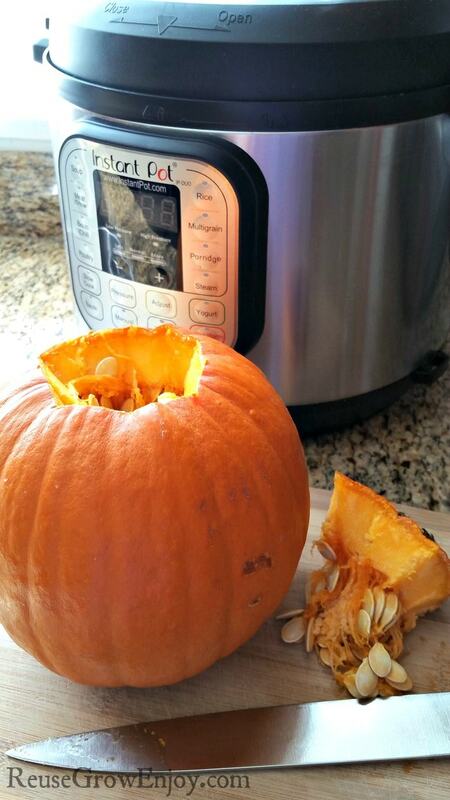 After it finishes in the pressure cooker, you will just carefully scrape off the pumpkin meat off the pieces and toss away the pumpkin peel/skin. 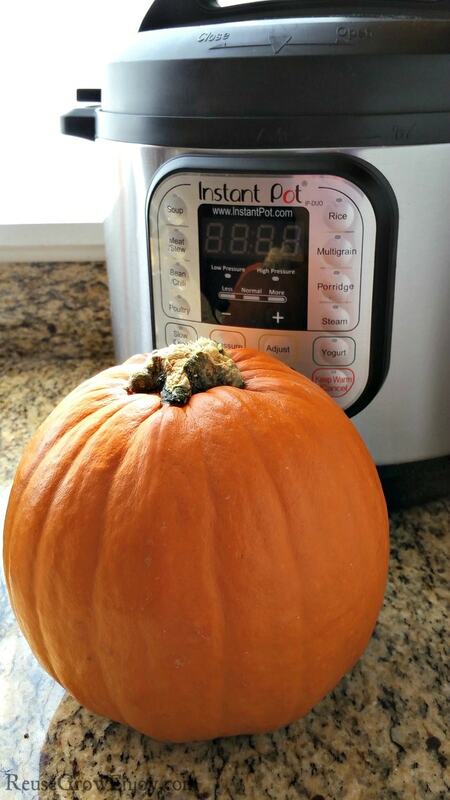 How much you can fit into the Instant Pot will depend on the size you have. The one I use is a six quart and the small pie pumpkin fit in it just fine. After you make this fresh pumpkin puree, if you are looking for ways to use it, here are some wonderful pumpkin recipes to try. Healthy Pumpkin Muffins – A Must Try Pumpkin Muffin Recipe! Start by washing the pumpkin off first. Then cut the center top off. You want it to remove the stim area as well as open up the pumpkin up. Next, remove all the seeds from the pumpkin. You can set them aside if you want to use them later to make roasted pumpkin seeds. Place the trivet into the inner pot of your Instant Pot. Then add 1 cup of water and place the cleaned out pumpkin on top of the trivet. Place the lid on the pot and lock it into place and put the valve to seal. Follow cook and vent times below. After it is finished and the pressure is out, remove the lid and allow to cool for about ten minutes. Then dump any water out of the pumpkin and the pot. 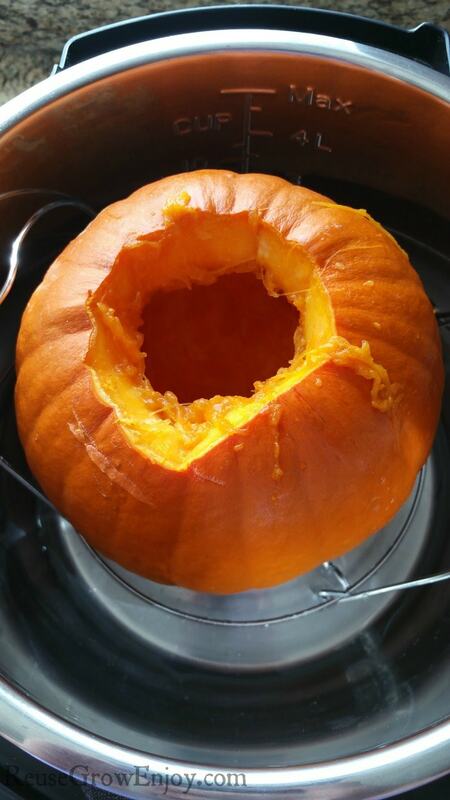 Using a spoon, scrape out the inside of the pumpkin making sure you get all of the pumpkin flesh. You can put the scrapings right back into the empty pot. Once you have it fully scraped out, use a potato masher or immersion blender to blend the pumpkin until you have that puree texture. You want it to be smooth with no lumps. First, wash pumpkin off. Then cut the top center around the stim off. Scoop out all the seeds. Add one cup of water to the inner pot and put the trivet in the bottom. Place the whole cleaned out pumpkin on the trivet. Place the lid on the pot and lock it into place. Make sure the valve is on seal. Push the manual button and add cook time to 12 minutes. After it beeps that it is done, allow it to NPR (natural pressure release) for 10 minutes until the seal drops. When the pressure is out, remove the lid and allow to cool for another 5 to 10 minutes until it is cool enough that you can touch the pumpkin. 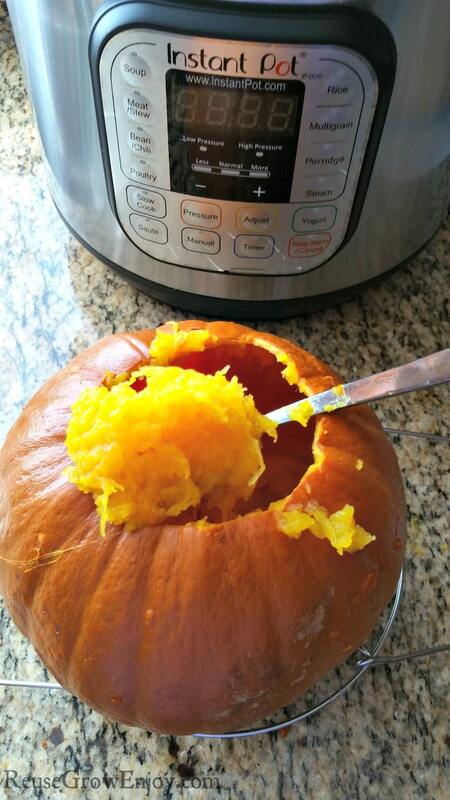 Next, dump any water out of the pumpkin and the pot. 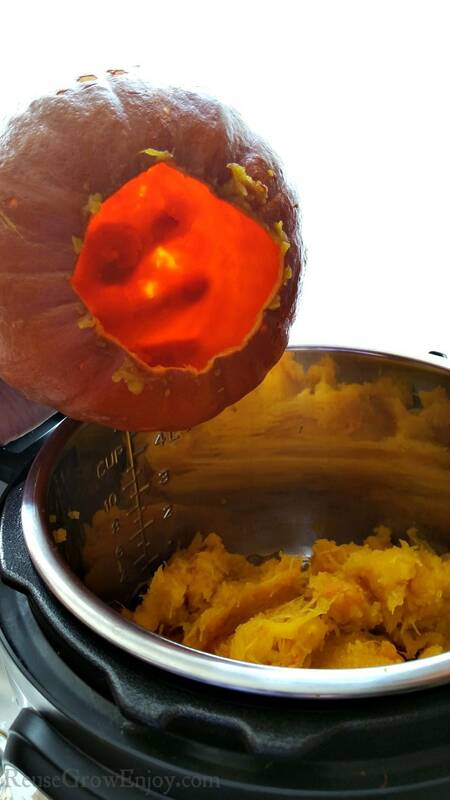 Using a spoon, scrape out the meat of the pumpkin and put it back into the empty pot. Use a hand blender or potato masher to blend until puree is smooth.